Have you ever had a ton of carrots and wondered what delicious foods you can make with them? Wonder no more. I bought close to 10 pounds of carrots when I saw them at a ridiculously low price, and then I was wondering what to do with them. This carrot soup recipe was the perfect solution for using up large quantities of carrots, didn't require buying other veggies that I may or may not have had in the house (because it was carrots that were on sale, not other stuff), and didn't require any expensive ingredients. This soup was a hit in my house- hope everyone likes it as much as my family did! I based it on this recipe, but made changes to make it perfect for my tastes. It is perfect for many diets, including grain free, vegan, gluten free, paleo, etc... in addition to being super frugal! And yes, carrots are one of the cheapest veggies you can get in the winter, so hurry up and make some today! 1. To start off, you want to cook your chickpeas, so they can be roasting while you're making the rest of the soup. Toss your drained chickpeas with oil, salt, and cumin, and then place it on a baking tray in the oven, in a flat layer, at 450 degrees or so, for 10-20 minutes, mixing them every 5-10 minutes or so so they don't burn. Watch them carefully- better take them out when they're semi crunchy and not completely crunchy, instead of overcooking them and burning them. They're a nice topping even if they're not super crispy, but are even soft with a bit of crunch. 2. Chop up your carrots and onions and garlic. 3. Heat up your oil in a pot, then add the onions and garlic- saute until golden. 4. Add the carrots and cook for 5-10 minutes or until softening. 5. Add the water, bring to a boil, then simmer until the carrots are completely soft. 6. Blend up, either with an immersion blender or a food processor or regular blender. 7. Add coriander, cumin, and salt. 8. To make the tahini paste, I don't have an exact recipe, but... Take your tahini paste, and mix it with a tiny drop of water. Mix it very well. It'll thicken up a drop. Add some more water- but only a little, or it will separate, and it'll thicken up some more. Add more and more water, a drop at a time, until it starts thinning out. Add lemon juice and salt and more water to taste. 9. 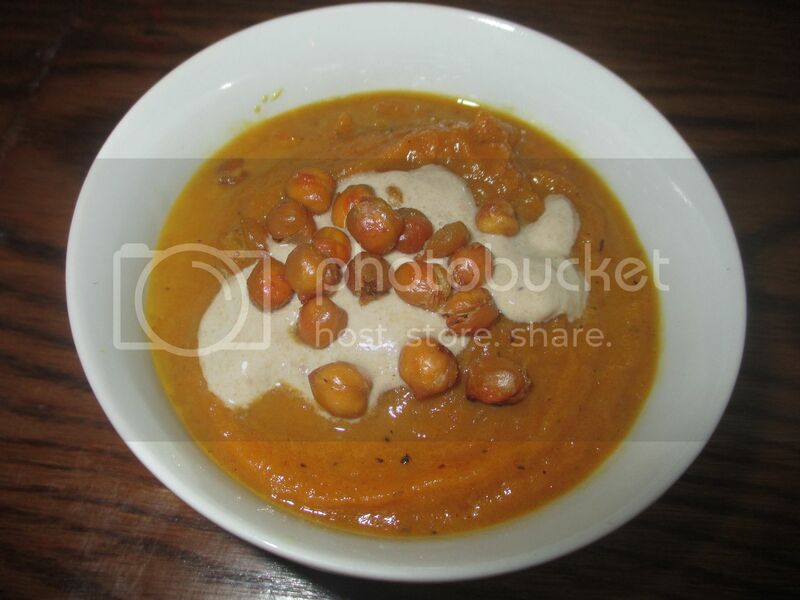 To serve your soup, ladle hot soup into the bowl, and garnish with a splash of tahini and the chickpeas. What is your favorite recipe to make with carrots, when you have a bunch of them to use up? Does this look like a recipe you'd enjoy? Are there any ingredients in this that you don't generally keep stock in your house?